This morning marks exactly 12 months since Group 81 first landed here in Samoa. It’s weird how in some ways it feels like we just got here, and the last year has gone by in the blink of an eye—and on the other hand, it feels like we’ve been here forever. The last 3 months—particularly the last 6 weeks—have been unexpectedly (and expectedly) historic for Samoa, and it’s been rather incredible to be living in this time and place. Some of it’s been quite a shock to the system; also it’s been good for site traffic. In any case, the following is a brief history of the last 3 months. While July marks the dog days of summer in the northern hemisphere, July is the middle of the dry season here and also the middle of the school year. Classes seemed to be advancing swimmingly. I was able to stretch out and give my year 13s time to take wrap their brains around the more difficult components of Microsoft Excel. But just as I was starting to get things right on schedule, the Swine Flu epidemic hit. There were over 100 cases of Swine Flu in Samoa; nearly all of them secondary school students. The government recommended schools shut down for the last week of July, and then forced schools to shut down the first week of August. This gave volunteers an excuse to hang out together and wait out the pestilence, but it wreaked havoc on the school year. I and 5 of my fellow Peace Corps found time to participate in the 1st annual 64-mile perimeter relay race around the eastern side of Upolu. The weather mostly cooperated, and we placed second overall. It was a fascinating (and ominous) tour of the island. Other than that, August was a slow month, and I took the time to hike the Robert Louis Stevenson trail, cook a helluva lot of pumpkin, and conduct social experiments. The month was spent marking time since September promised to be a busy month. 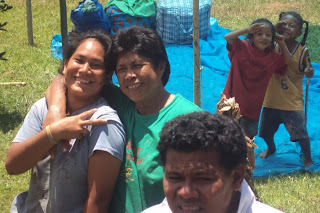 Amanda swooped in early in September, and we had a good time checking out Teuila Festival events, making friends at the Faofao Beach Fales, and playing Rummy with Phil. We were also able to gain tickets to the 2009 Miss Samoa pageant, which would provide the first huge bump in traffic on the blog. And then on Amanda’s last day in Samoa, the country became the first in history (or so I’m told) to switch from driving on the right side of the road to driving on the left. The über-controversial switch ended up coming and going without too many hiccups, save for an ongoing bus shortage. A week later, I was walking home from the Peace Corps office and noticed a bunch of people staring up at the likeness of the Virgin Mary on the side of the John Williams building. The apparition would become the explanation for many subsequent events. September had a number of other noteworthy aspects including Year 13 Camp, the burning down of Hotel Kitano, and an Around-the-Island tour with Koa and his friend Caroline. And then in the early morning of September 29, Samoa was rocked by an earthquake measuring 8.3 on the Richter scale. There’s been much fallout from that. Finally, group 82 showed up yesterday, exactly 52 weeks (or 364 days) after we did. And that’s the story so far. Yeah. I was in Apia for the quake, and the tsunami didn’t hit anywhere near here. What can I do? What do victims need? Where can I send money? Yeah. I'm going to refer you to Sara' blog. Was your host family affected? Nah. 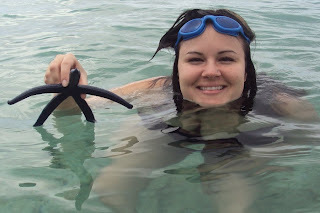 They have a large mangrove that separates them from the ocean, so they came out unharmed. I have family in __________ village. Are they okay? Once again, Sara has done a ridiculously good job of cataloging the state of different villages. It’s best to check with her. Hi Matt. I’ve never met you. Do you mind if I comment on your blog? Not at all! I love comments. Please comment. Hey Supy's Friend Lauren, that goes for you too. Tomorrow starts a new round of cultural exploration. Tomorrow’s topic will be Mourning. Pictures below. 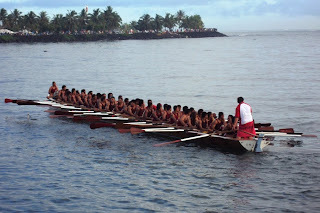 Traditional fautasi races finish in Apia Harbour as part of the Teuila Festival. Jacinta, the winner of the 2009 Miss Samoa Pageant. Family from Saleaaumua, one of the villages hit by the tsunami. For your last year you could try to learn to speak the language better than you have so far. Your language is fine! You are gifted...read the post above. You have followers...people living vicariously through you. What more could a guy want. Aww I love the party header! Congratulations on making it 1 year! I'm very proud of you! I can't believe it's been a year. I hope the next year brings many more (safe) adventures. I love you, you're my brother. Hi...Nice decor on the island! I can't believe you've been gone a whole year! You're right...in some ways it seems like you just left! I liked the recap. I agree with Lisa...I look forward to every post. Love you. i look forward to accounts of the year ahead! Great writing style Matt, and definitely appreciating the regular posting. I cant get over the fact you can still keep it up (the blogging every single day unless something's come up) after a year! You said you dont mind random comments from random people. 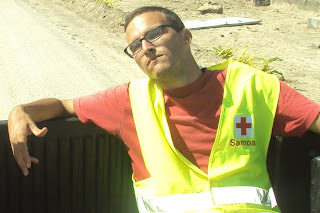 I wonder how you would feel if someone randomly came up to you in person in samoa and told you they were a reader of your blog? Actually I've done that already, showed up at Matt's door while killing time in Apia earlier. He was a little freaked out but gaciously invited my daughter and I in to share his hospitality. I got to see the engine room where Scotty toils to keep the Enterprise flying, and it was surreal how crazy it seemed that Mataio was reaching the world from there. Absofreakinglutely inspiring stuff, it should be part of a tour whilst in Samoa for the next 12 months.